This steak fajita chili recipe is brimming over with chunks of fork tender beef and fajita style vegetables in a rich, spicy chili base. The whole recipe is made on the stove top to coax out the flavors that only one pot meals made in layers can deliver. There is nothing quite like the look or feel of fresh fajitas sizzling on a platter in a Mexican restaurant. Today’s recipe for steak fajita chili brings the taste of fajitas to the stove top in the form of another Mexican favorite – spicy chili con carne. The cold weather always gives me a yen for chili. And since my daughter is arriving this week for a visit and her favorite meal is Mexican fajitas, I decided to mix the two dishes in one as a treat for her. For another twist on fajitas, be sure to check out my oven baked chicken fajitas. They have all the flavor but without the sizzle platter! 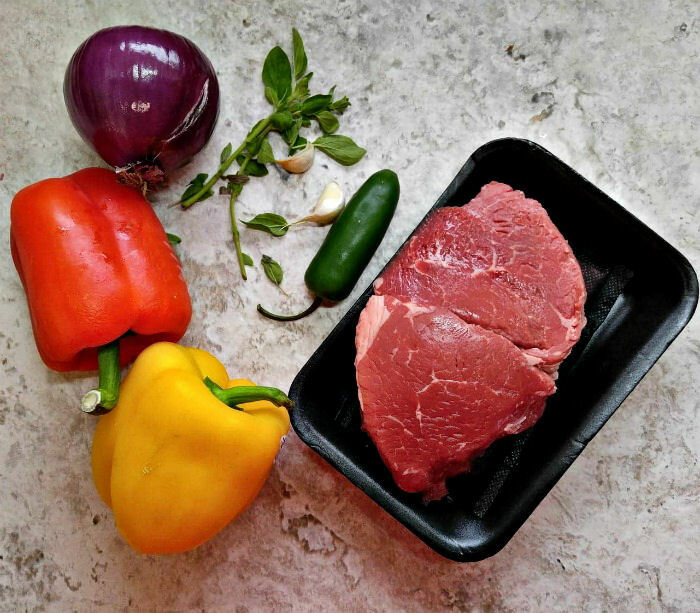 The base of this delicious chili comes from the best ingredients of Mexican fajitas – colorful sweet peppers, jalapeño peppers, red onions, garlic and sirloin steak. 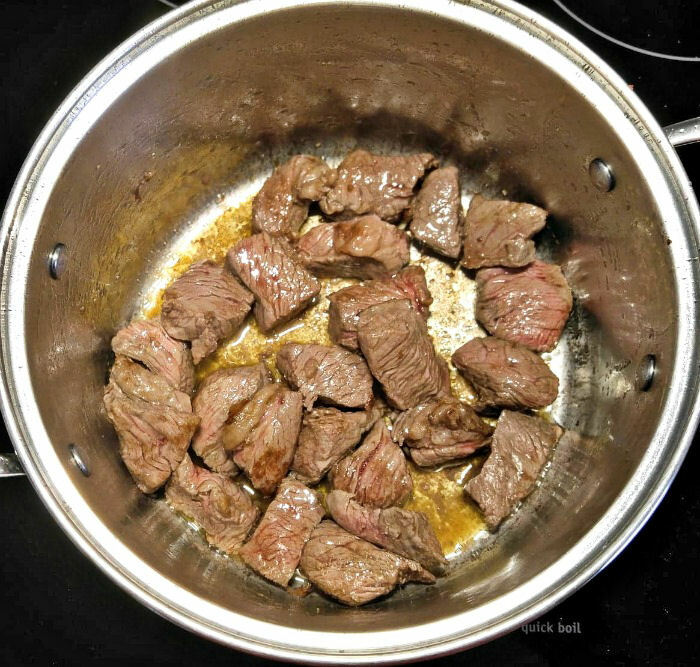 Start by heating the olive oil in a large Dutch oven over medium high heat and cooking the steak pieces until they are browned on all sides. Once they are nicely browned, remove them to a plate and keep warm. Add the diced sweet peppers, jalapeño, onions and garlic to the pot, being sure to scrape up the bottom crusty bits which will help to flavor the sauce. Cook until the vegetables are starting to get tender, about 4 minutes. Now it’s time to add the chili fillings. I used black beans, diced tomatoes, tomato juice and some chili powder, cumin and fresh oregano as well as sea salt and cracked black pepper. Give everything a good stir to mix it all up well. 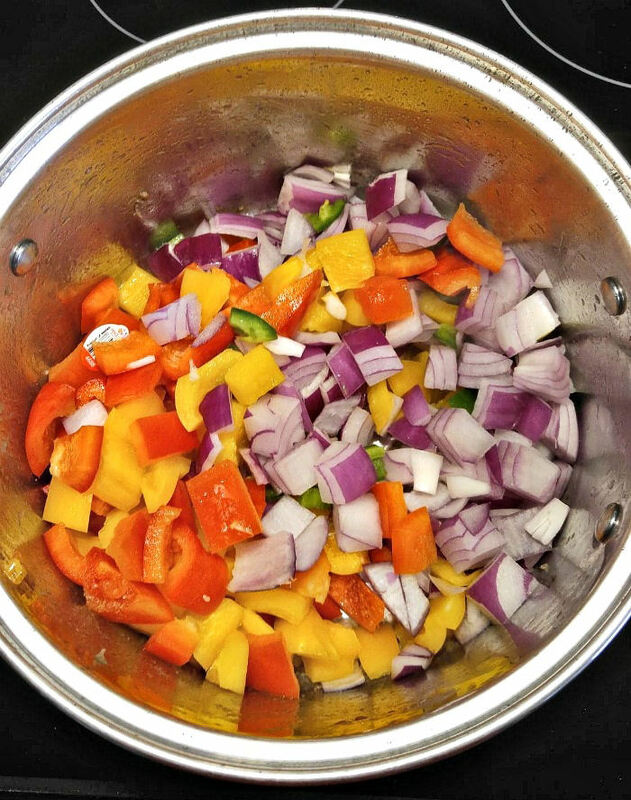 You kitchen will smell amazing right about now. I love the look on my husband’s face when he walks in the door, takes a whiff and says “we’re having chili tonight!” with a big grin. 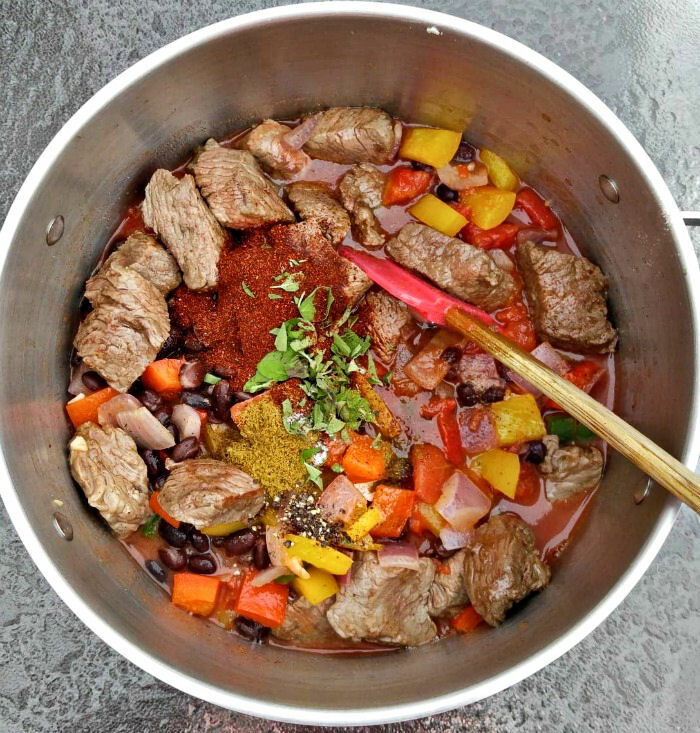 It’s time to get creative when we serve this chili. I want to deliver the taste of both fajitas and chili to the toppings as well as to the recipe itself. 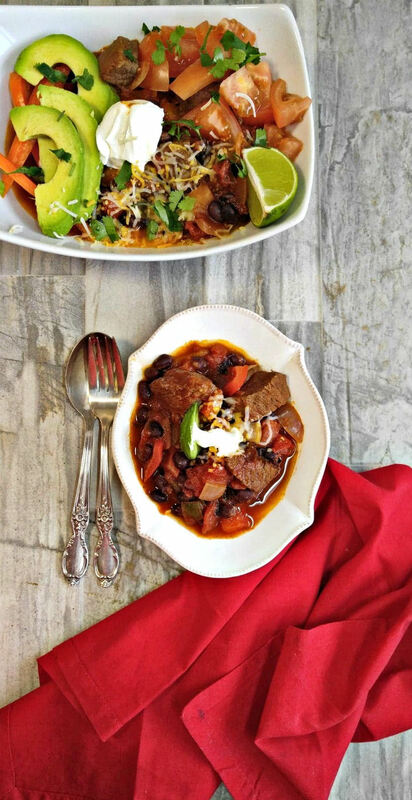 Spoon the chili into bowls and add your favorite toppings. 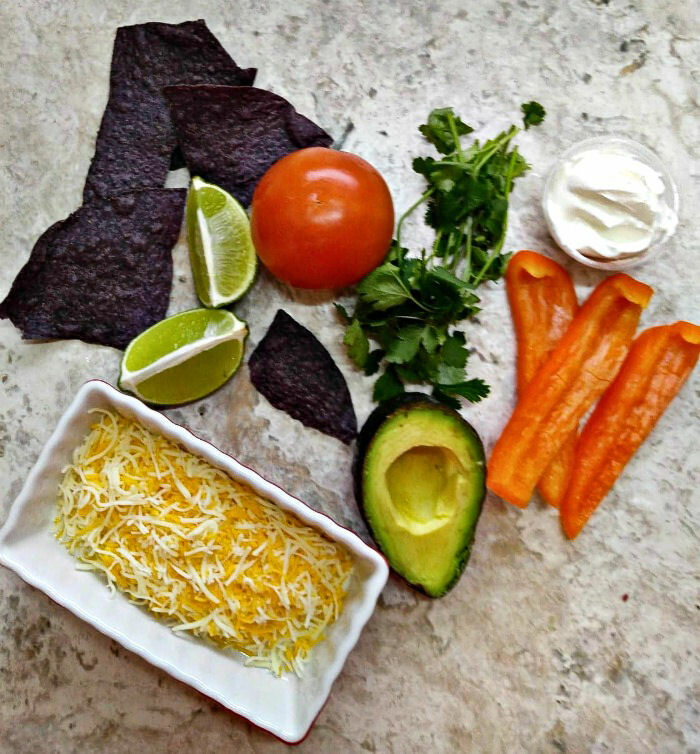 I like to use a variety of toppings for this tasty Mexican recipe. Mexican cheese – just because! Tasting a bowl of this Steak Fajita chili. Every mouthful of this delicious chile is just bursting with Mexican flavor. 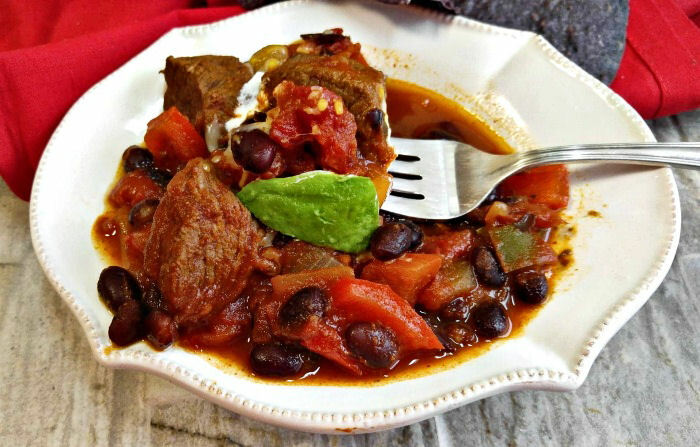 The beef is fork tender and the sauce and beans give everything a delicious hearty flavor. This chili also makes a great topping for hot dogs to turn them into the best tasting chili dogs. Or think outside the box and turn normal baked potatoes into a meal by itself by spooning the chili over them. This steak fajita chili has all of the flavors of a sizzle platter of fajitas heaped with your favorite toppings for a great chili experience. It has become one of our favorite chile recipes. If you love Mexican recipes, be sure to check out my sour cream chicken enchiladas. They are super tasty! 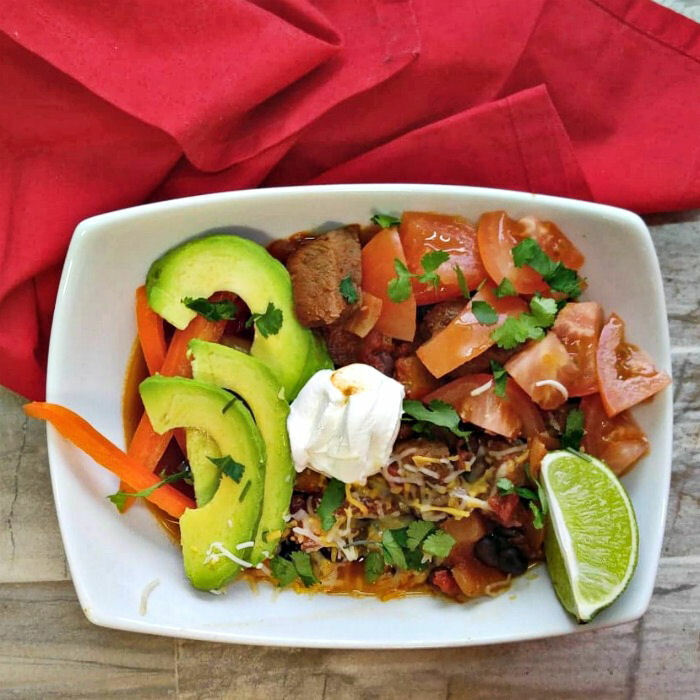 This steak fajita chili has all of the flavors of a platter of fajitas but is served in a bowl with toppings for a great chili experience. Add the oil to a large Dutch oven over medium high heat. Cook the steak pieces until they are nicely browned on all sides - about 6 minutes. Remove and keep warm. Add the sweet peppers, jalapenos and ontons to the pot, scraping up the bottom crusty bits. Cook until the vegetables are starting to get tender, about 4 minutes. 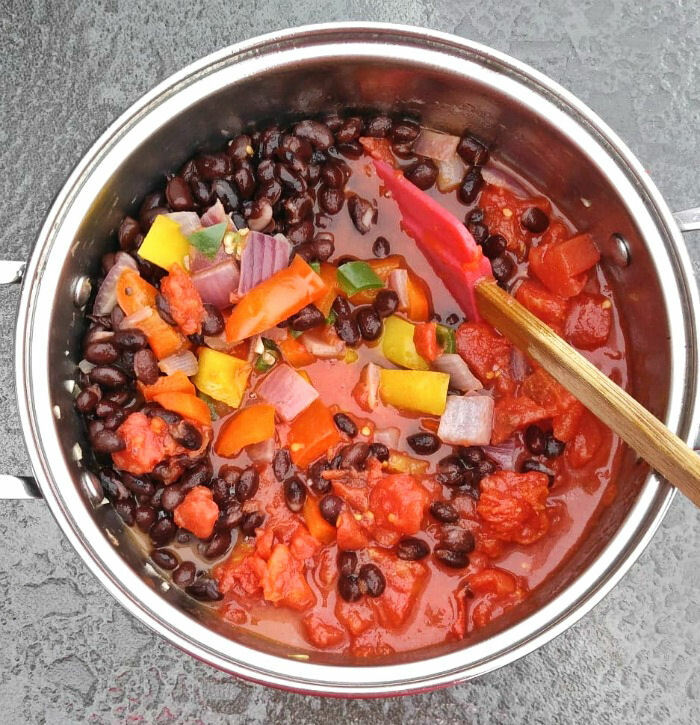 Stir in the black beans, diced tomatoes, tomato juice, spices and herbs. Stir the reserved steak back to the pot, bring the mixture to a boil, then reduce the heat and simmer for 30 minutes until the chili starts to thicken. 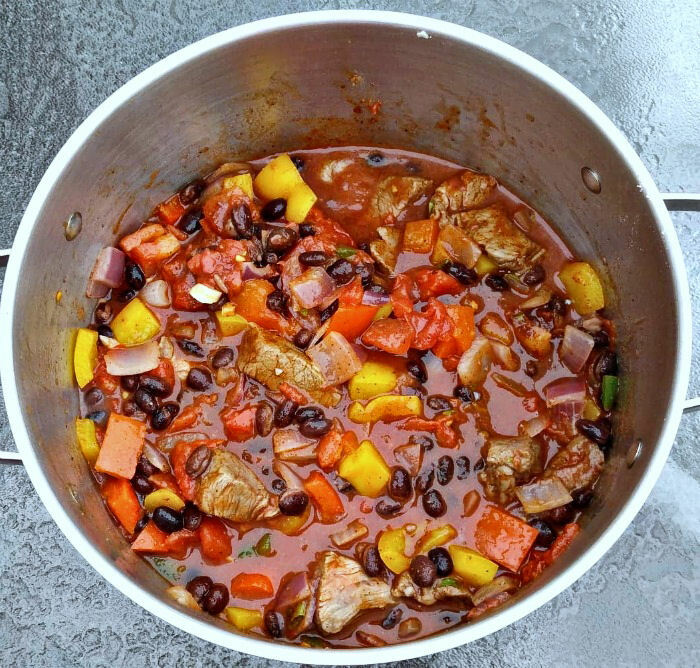 The longer you cook the chili, the more it will thicken. 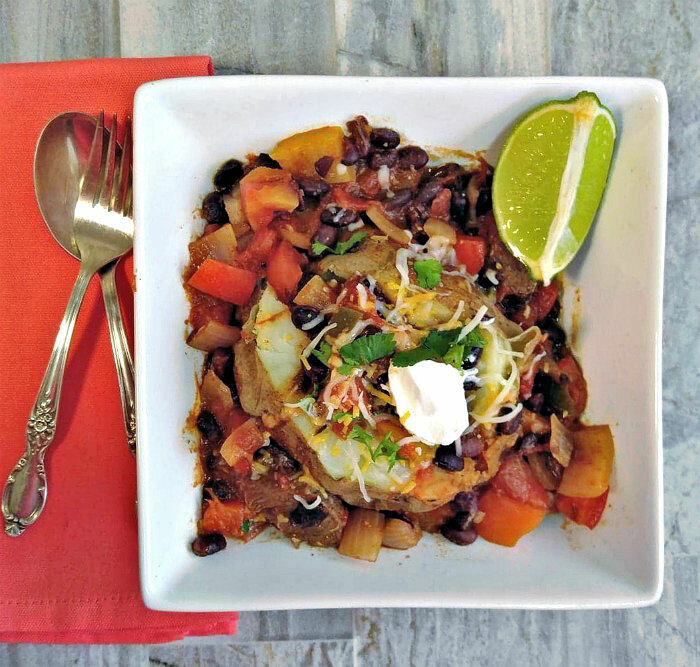 Spoon the chili into bowls and top with your favorite toppings. It also makes a great topping for hot dogs or baked potatoes. The calorie counts are for the chili only. Toppings are extra.